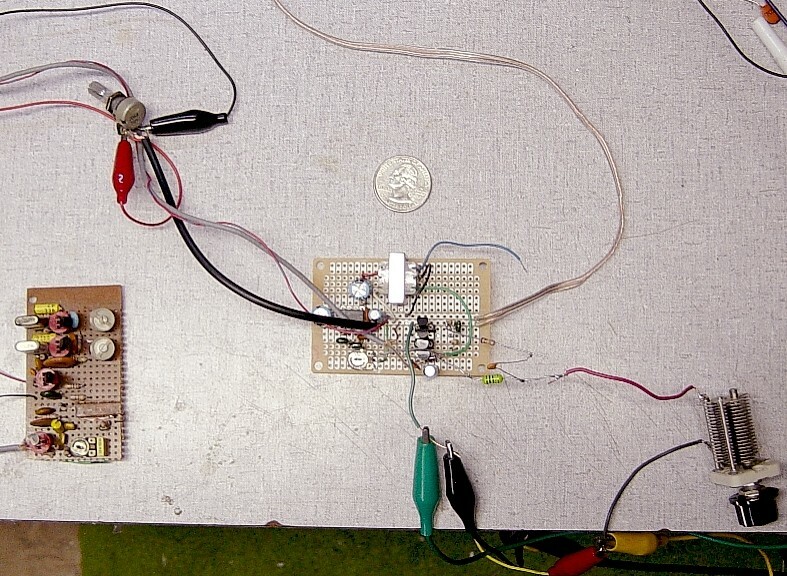 The small Proto PC board (center) holds only the LM386 audio amp, the modulation transformer, & the MPF102's. The oscillator is the separate board to the left. The mix product of the 2 x-tals is amplified, rectified, low-pass filtered, and amplified again, to deliver a clean, stable sinewave to the FETs input. In this case, that difference frequency is 1630Khz. :) My freq counter shows it to be very stable, within +/- 10Hz... that's "ROCK-STEADY!" This box is the package my wallet came in! LOL! :) It was a nice tin box, so I saved it for a future project! Well, here it is! It's a nearly perfect fit. It just took a bit of cutting, bending, and squeezing the metal to make everything fit. Two 4-40 screws & nuts hold each board in place. The plastic/velvet insert makes an ideal insulator. With the lid on, the shielding is just about perfect. "Stay Tuned!" ;) There's ALWAYS MORE TO COME! !